“The politician performs upon the stage: the historian looks behind the scenery.” This distinction, made by British historian AJP Taylor, was expected to come true when former president Pranab Mukherjee took to stage at the Rashtriya Swayamsevak Sangh (RSS) headquarters at Nagpur on Thursday. That was not to be. Mukherjee, a schoolteacher in his formative years, could have donned both the roles with ease. As a politician with a highly distinguished track record having attained the pinnacle of his vocation, he could have performed on the stage and delivered a memorable exposition – which he was capable of. Given his five-decade association with politics and his understanding of entire gamut of political and social complexities, his words at the passing out parade of the rigorous three-year course known as officers training camp (OTC) for integrating committed cadres in the RSS fold would have acquired a new meaning. Similarly, his scholarly understanding of contemporary politics and history would have served adequate caution for practitioners of politics pursuing divisive agendas to achieve their objectives. Sadly, Mukherjee failed to live up to the expectations in the either role. As a politician, he appeared to be not only cautious but also extremely circumspect. He seemed to have concealed more than he revealed at the stage. Look at his career record, and you would know why Mukherjee’s exposition at the RSS function was marked by much less candour and merely reiteration of RSS chief Mohan Bhagwat’s earlier speech that talked about inclusiveness of India. In his role as a Congress party leader, Mukherjee had always been at the forefront of launching attacks on the RSS-BJP combine and drafted many resolutions which describe Hindutva forces as “inimical” to the Idea of India. There is a strong possibility that Mukherjee might have changed his opinion following his closer interaction with the RSS and the BJP in his role as the president. He seemed to have developed a cosy relationship with prime minister Narendra Modi whose credentials as a former RSS pracharak is not a secret. If there is a change of heart, Mukherjee should have acknowledged it and explained the reasons for it. Far from it, Mukherjee’s speech was full of inanities and politically correct phrases which signify nothing. As one of those rare politicians who saw the growth of the RSS and the evolution of Bharatiya Jana Sangh (BJS) into the BJP from a marginal force to a principal political pole, it is quite a genuine expectation from Mukherjee that he would explain this political trajectory and its compatibility with Indian constitutionalism. Having attained the maximum that a living politician in India aspires for, nobody is as equipped as Mukherjee to explain India to the leadership and cadre of the RSS whose worldview is not aligned to his understanding of the nation. But Mukherjee chose to tread very cautiously and avoided any politically contentious issues in order to insulate himself from any criticism. Equally disappointing was his role as the historian as he made casual reference to history that once again avoided the ideological flashpoints. For instance, when referring to the post-independence phase, his skirting the reference of Mahatma Gandhi’s assassination was conspicuous. Unlike Rahul Gandhi who rhetorically blamed the RSS for killing of Gandhi, Mukherjee, as a seasoned scholarly leader, could have triggered a debate on the existence of an ideology, irrespective of religion, that promotes violence and hatred. Similarly he could have also referred to the follies of the Emergency to caution the political leadership about the risk of authoritarianism. As an elderly statesman, he would have done well to talk about how religious fanaticism is the worst tool of political mobilization that once led to the demolition of Babri mosque and triggered widespread riots in the country. 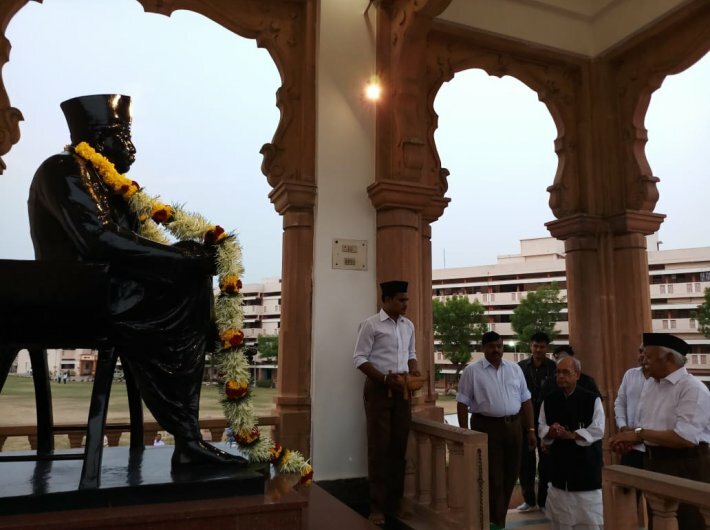 The platform at the RSS headquarters was the best opportunity for Mukherjee to articulate what he stands for and his own scepticism about the Hindutva ideology. If Mukherjee had remembered the exchange of letters between Sardar Patel and RSS’s second sarsanghchalak MS Golwalkar or Jawaharlal Nehru and BJS founder Syama Prasad Mookerjee, he would have realised that the bitterest differences of opinion could have been conducted in a highly civilised manner without hurting anyone’s sentiment. Mukherjee could have taken a leaf out of Patel’s remarks on the RSS in his correspondence with Nehru. Sardar praised the Sangh for its nation-building activities, but at the same criticised it for its militant attitudes. A stalwart like Mukherjee who served the nation distinguishably in his various roles could not have been faulted for speaking his mind and enriching the political discourse. Mukherjee has evidently wasted this opportunity. In contrast, Mukherjee’s contemporary LK Advani, trained in the RSS, was more forthright on Jinnah and Pakistan than Mukherjee was on the RSS. Advani truthfully reminded Pakistan of Jinnah’s original secular vision, even if he had to pay the price for his audacity of falling out of the RSS’s ideological line and he was marginalised within the Hindutva fold. But Mukherjee faced no such risk as he is well past the stage of being a career-politician to worry about the future. Yet his circumspection and caution appeared nothing but a reminder of traits of a career-politician.